12 Dec 2017 by Alan N.
Really sturdy and well made. Excellent protection afforded. Mum has lots of these boxes for her artwork as she is local artist. These boxes are a great storage solution for her work. She needed a larger size than she had and checked on Really Useful website and was more than she wanted to pay due to postage. So she checked amazon and found as free delivery with prime this worked out lots cheaper. Quality is great as expected having already owned lots of these in various sizes. So she is super happy. I love RUBs and over the years have accumulated quite a few in different sizes, up to 84 Litres. 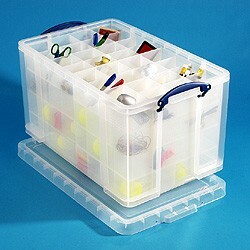 I'd like to get a couple of the massive 145 Litre boxes but haven't found anyone selling them at realistic prices yet. It's a personal thing but I'm not sure that the most recently bought RUBs are quite as solidly made as the earlier ones that I have. However, that's a very subjective observation and I can still say that 'In My Opinion' the RUB range of storage boxes are the best quality and strongest on the market and are generally very competitively priced through Amazon. Best storage boxes by a country mile! As the title says. These boxes may cost a bit more than the cheaper flimsy boxes you can buy, but they are so well made. They have heavy-duty reinforced corners, supported all the way down the depth of the box by the 3 vertical pillars you can see in the image, so when stacking they never crush, break or warp the lids of lower boxes when stacked; they stack really well with no chance of slipping & you can stack really hight with no chance of them breaking lower boxes in the stack. 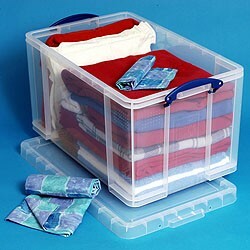 The blue retaining clips fold over the top & snap shut at either end keeping the lid tightly in place, so you can really stuff these boxes with items such as clothing or blankets and the lid snaps on firmly packing the contents. I have bought 8 of the 84 Litre size units and you can stack them even with heavy items like tools, books or CDs etc inside no problems. I went to every competitors store checking their boxes to find good ones, and nothing comes close to this product. They are from a British company too! Quality of Product: 5 out of 5. Value of Product: 5 out of 5. Ease of Use: 5 out of 5. I bought one of these storage boxes from another outlet, but they did not have any more... then I found that Dunelm did them cheaper and got another one. 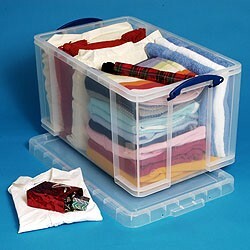 Perfect for storing large dust sheets and a bonus being that you can see what's in the box! Yes, I recommend this product. Quality: 5/5. Value: 5/5. Appearance: 5/5.